Im a caring giving person. 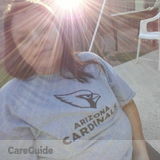 Ive worked in care centers, one on one n in group homes. I love this kind of work n ready to be a helping hand. Thank You and god bless!